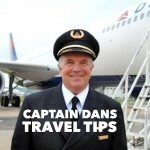 This is part 3 of the series Cruising on the Norwegian Dawn from the port of New Orleans. 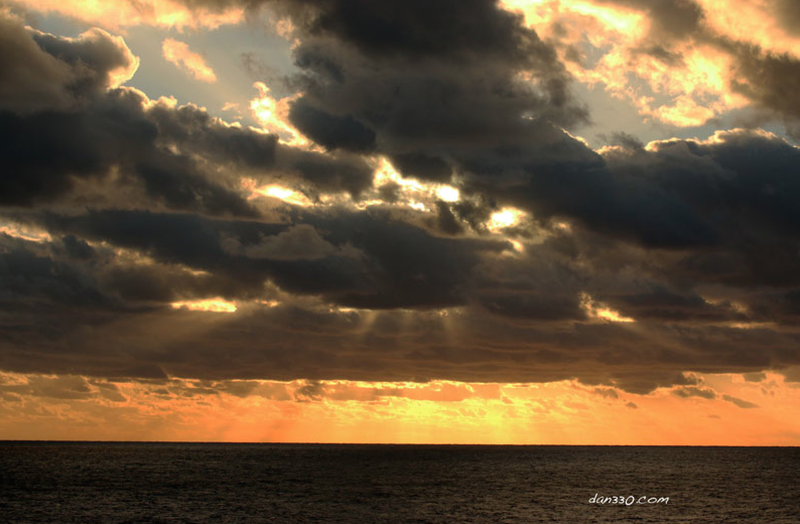 Day 2 of this cruise is at sea enroute to the first port of call, Cozumel, Mexico. 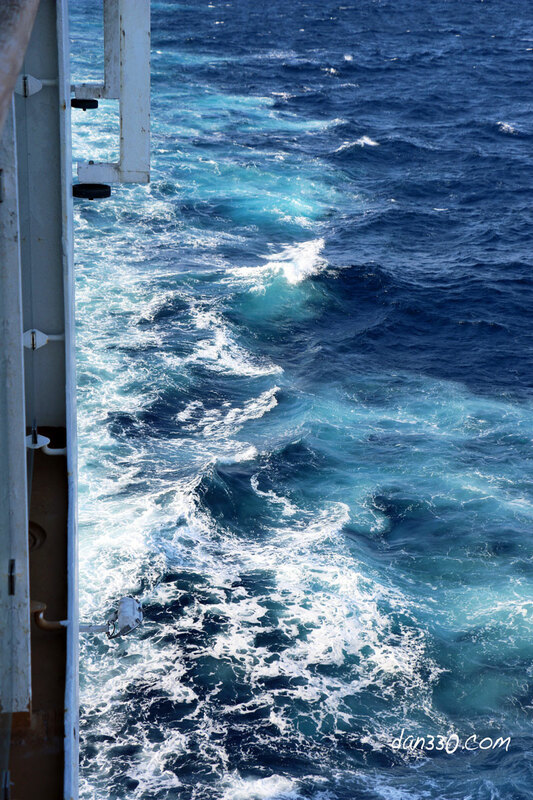 If you have never cruised before, this is not unusual to spend a day at sea. Not to worry, Norwegian Cruise Lines has done a great job of offering you any number of ways to be entertained. This was a working vacation for us so we actually like a day at sea to get caught up with processing photos etc. On a seven day trip it is not unusual for us to take well over 1,000 photos. 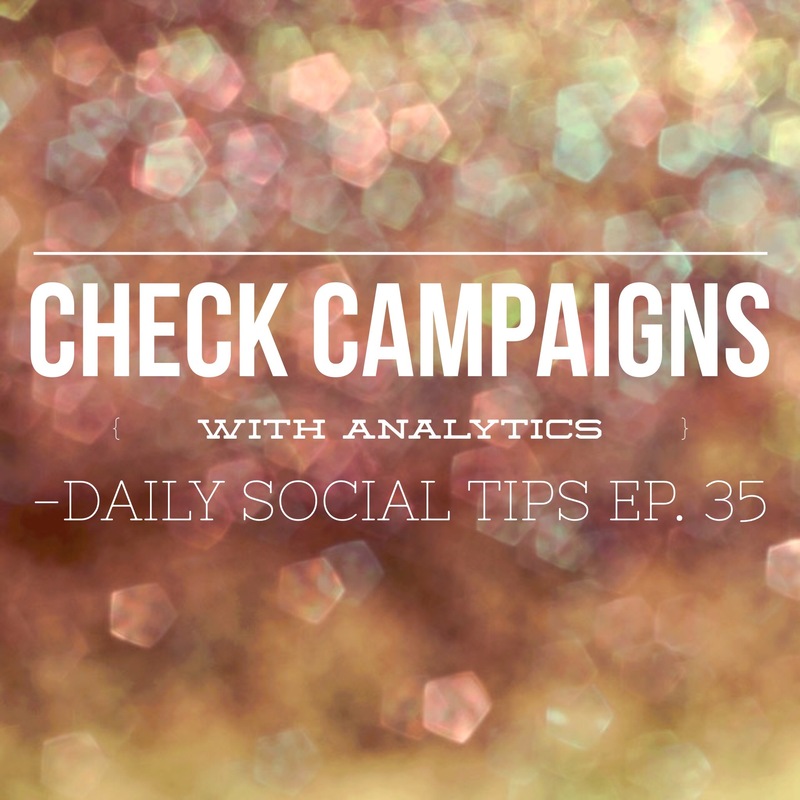 If you don’t keep up and label them it can be quite challenging to compile a story a month or two later. Sailing out of New Orleans in January can subject you to cooler weather than you might expect. If I remember correctly the high temperature the day we departed New Orleans was around 48 degrees. A massive cold front went through the day before we left and was still out in front of us in the Gulf of Mexico. This meant that tropical weather was going to be delayed until day 3 of the cruise. We are from Minnesota so the temperature still felt pretty good to us. I used to fly to Cozumel and Grand Cayman when I was working. There were definitely a couple of times I remember when we were landing at those airports that the wind was so strong out of the north, that it almost exceeded the crosswind limit for the airplane. North winds are not warm. These were really incredible cold fronts that caused these conditions. The good news is that this far south the effect of the front passes quickly and the ground and water are warm so the temperatures rebound quickly. If you have never cruised before here is something you probably haven’t seen. A daily activity sheet that is left in your cabin when your bed is turned down for the night by the cabin attendant. Here is what you typically find when you retire to your cabin for the night: the next days activity schedule and a new towel sculpture. 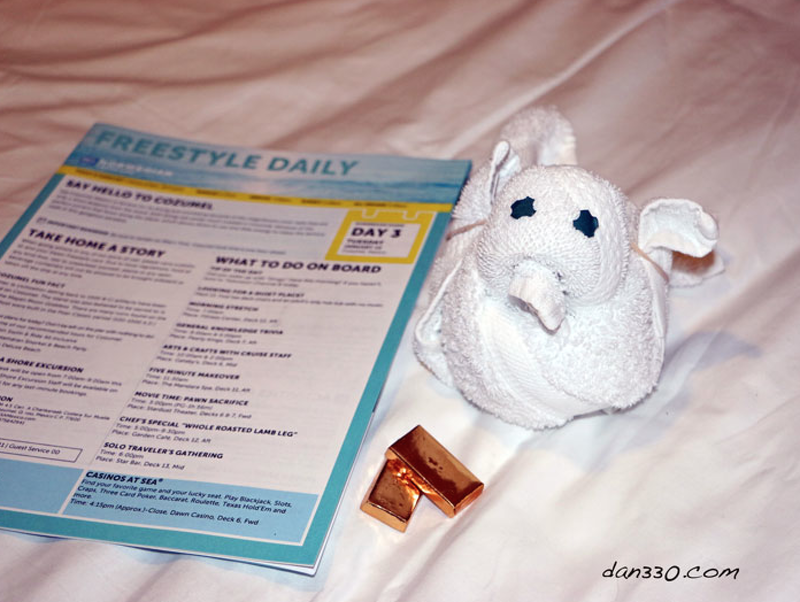 Our cabin attendant had a different towel sculpture for us every night. 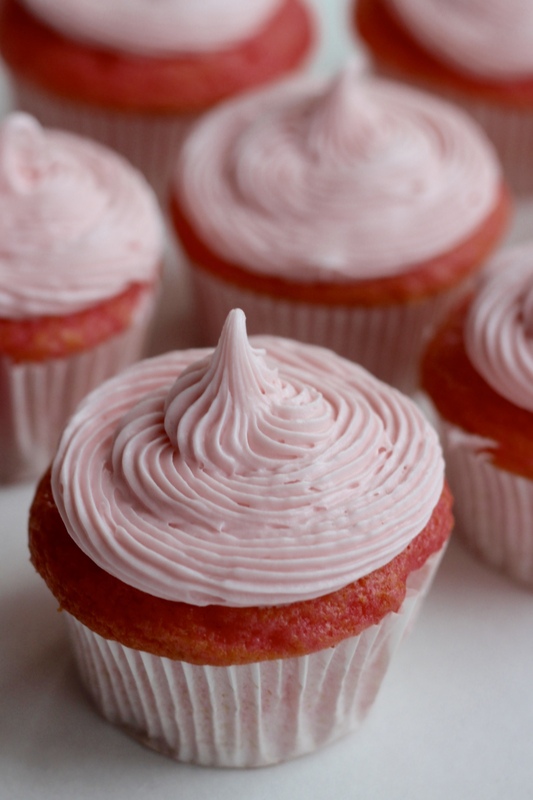 It seemed like every day at some point we had a special treat delivered to our cabin as well. There were really a lot of very nice touches on this cruise. Here is a typical “surprise” in our cabin. 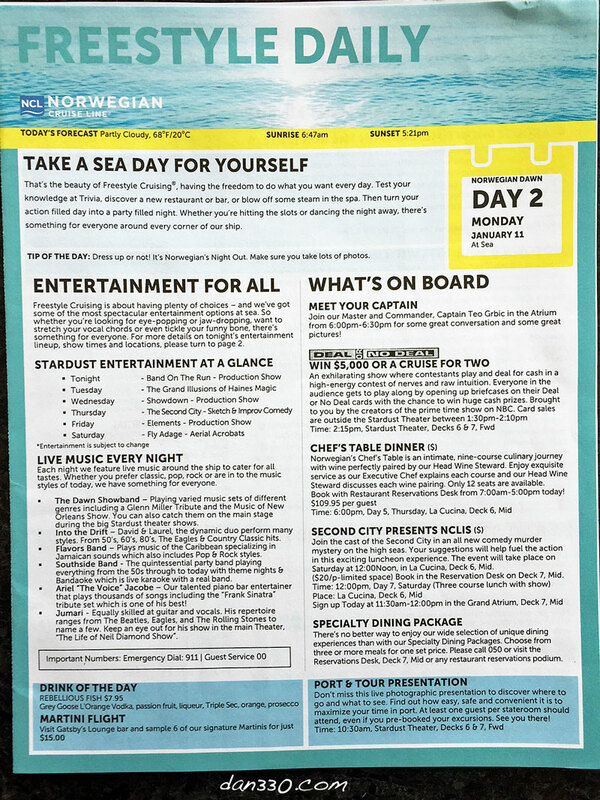 You can see from the daily schedule that there is so much to do every day of a cruise. There is something for everyone and almost every interest. With Norwegian’s Free Style dining you have many dining options. 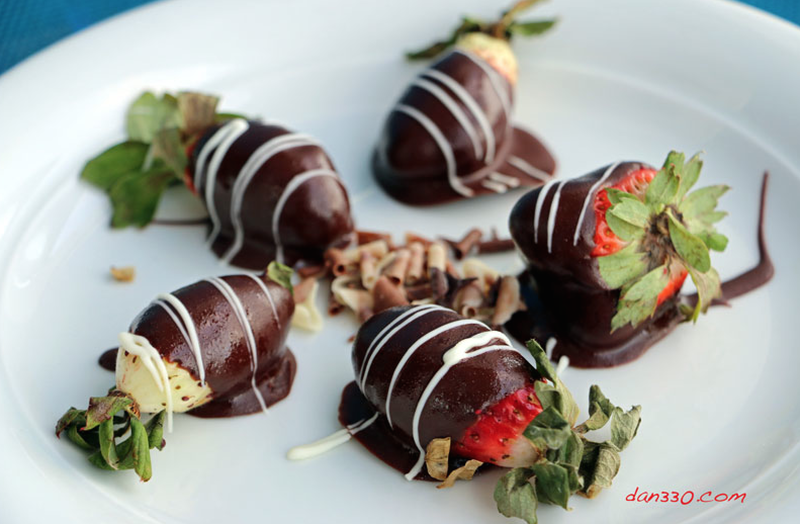 Take advantage of a day at sea early in the cruise to check out the dining venues and menus. 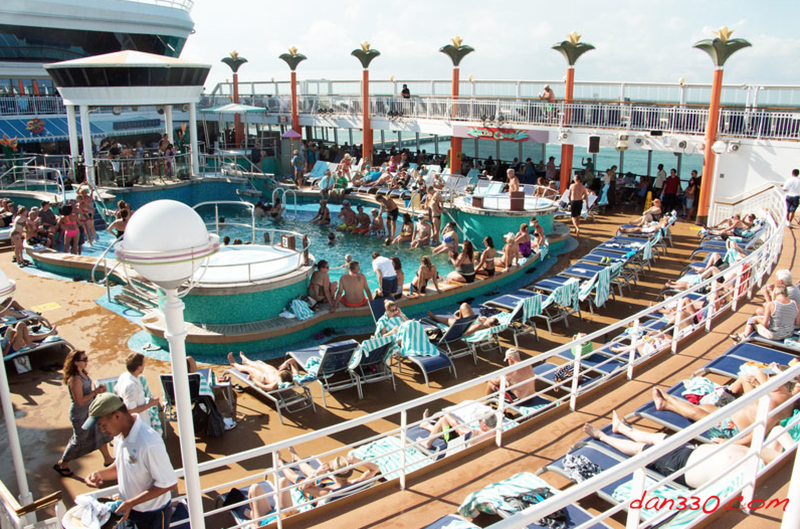 Lots of people took advantage of the pool area and the entertainment there as well on this day at sea. We sat out on the upper deck in the front of the ship and it was very comfortable. We actually had plenty of space too. The closer you get to the main pool and entertainment the more crowded you will find it. Here is a view of the rear of the ship from the Promenade deck. 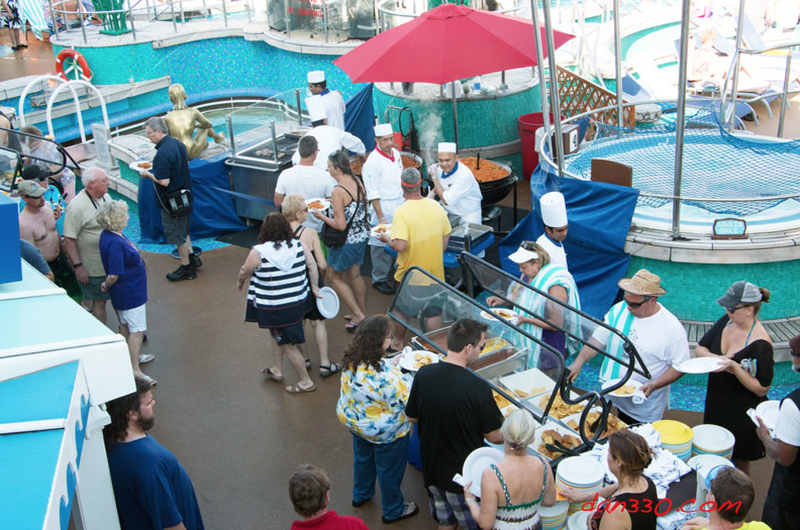 Another thing you will notice is that on days at sea there is usually food served in the pool area. 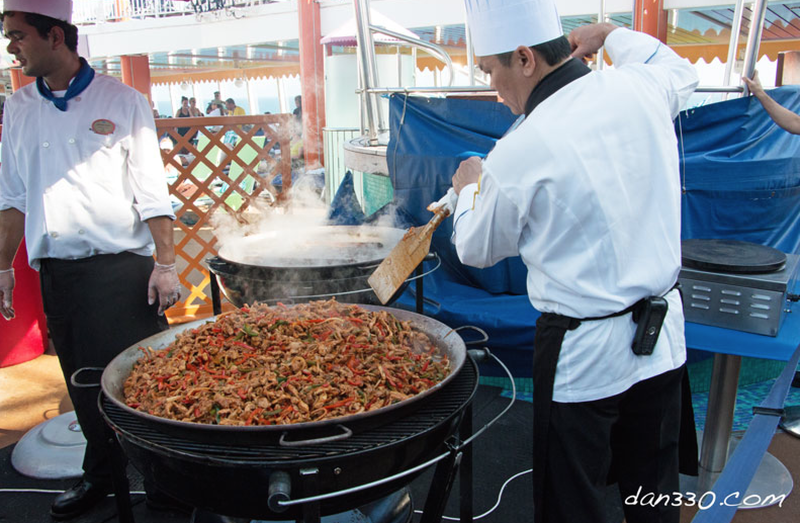 We had all the fixing for a Mexican buffet cooked poolside. The food was great and there was a large turnout. People enjoying the Mexican Buffet poolside. This may seem kind of weird but I got turned around on the ship occasionally. 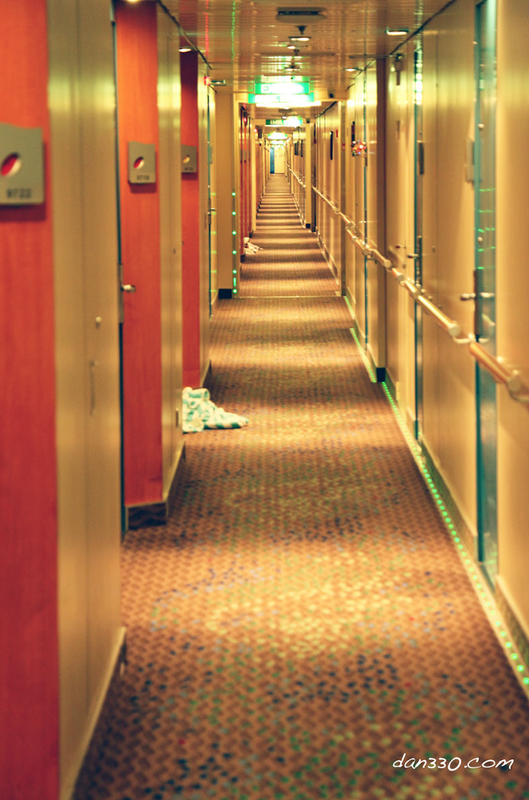 The deck where our cabin was had really long hallways. Like 900 feet long. Sometimes I got off the elevator and turned the wrong way. My wife broke the code for me. 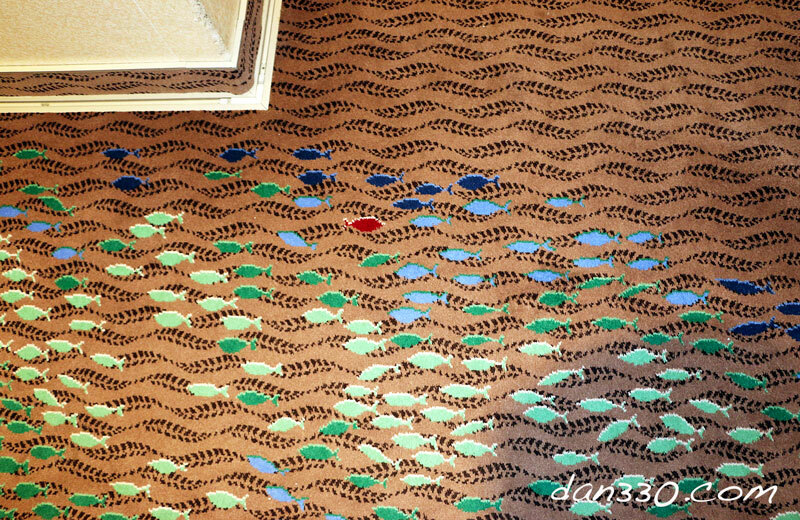 In the carpet pattern were colored fish. The red fish were always swimming towards the rear of the ship. Duh. That made my navigating indoors a lot easier. The red fish shows the way to the back of the ship. After we spent some time in the sun and lunch, we went back to our cabin and took a nap. That was really a treat and probably not an option for the next few days as we will be in port every day with lots of exploring to do. We took advantage of the free style dining to check out a new dining room, Aqua. Dinner for us was early as we were invited to meet the Captain and senior officers of the ship at a cocktail party. Pool area at night. The color changes too. We enjoyed being outside by the pool area after meeting the Captain. This turned into a busy day. Right after the Captains cocktail party it was showtime in the Stardust theatre. The entertainment that night was Band on the Run. The amount of variety and quality of the entertainment onboard these cruises is really impressive. We didn’t go to the production shows every night. We found that we enjoyed an evening cocktail in the Grand Atrium where there was nightly music on a smaller scale as well as great people watching. 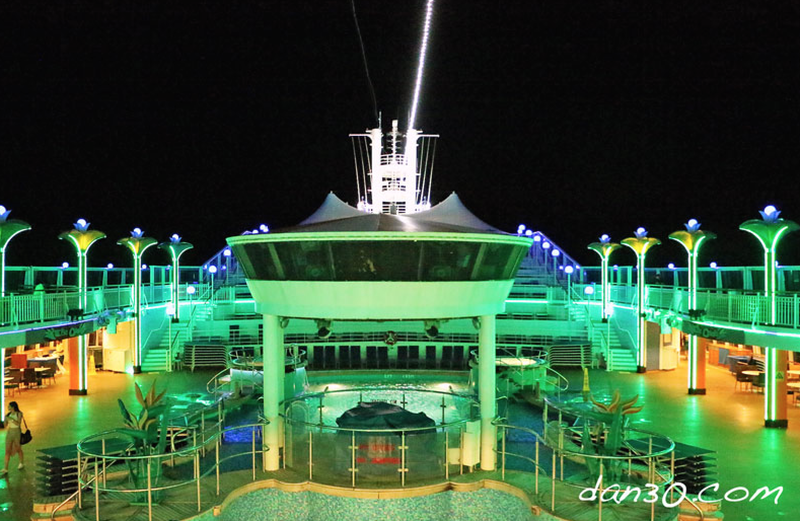 The Norwegian Dawn is beautiful at night. 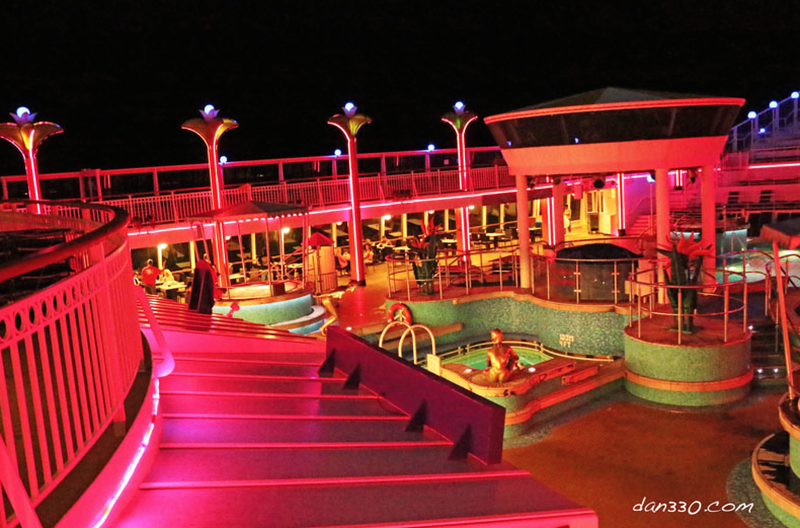 There are so many lights and the fresh ocean air called us to the promenade deck one last time. We did another lap and called it a day. Next up: Day 3 is a port day in Cozumel, Mexico. Take advantage of day 2 at sea to get in vacation mode. The hassle of traveling to the port is over. Relax and let Norwegian entertain you. If you haven’t booked shore excursions yet, get on it so the ones you want to do don’t get sold out. Explore the ship. There so many things to see. We were finding shops and venues right up until the end of our cruise. Remember: the red fish swim to the back of the ship.